It’s the day of goodbyes. After reporting about shows like Ek Boond Ishq (Life OK) and Tu Mere Agal Bagal Hai (SAB TV) going off air, it’s time to say a final good bye to Sony Entertainment Television’s serial Ekk Nayi Pehchaan (Jay and Kinnari Mehta Productions). The show will air its last episode on 25 September and today was the last day of shoot. With a happy ending planned, the entire cast will be seen getting together and performing a dance sequence as a parting treat for its fans. Ekk Nayi Pehchaan created buzz for it brought back Bollywood actor Poonam Dhillon to TV. 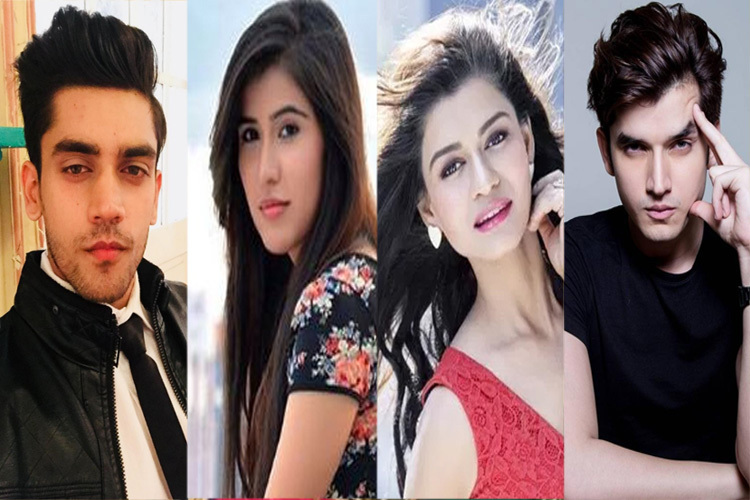 Actors like Sooraj Thappar, Krystle Dsouza, and Karan Sharma among others were part of the cast. Soon another Bollywood diva Padmini Kolhapure made her small screen debut with this show in a cameo role. Good wishes to the entire team of Ekk Nayi Pehchaan! With the entry of Sakshi’s ex boyfriend Aditya (Deepak Sandhu) in their lives, the sweet couple Karan (Karan Sharma) and Sakshi (Krystle D’souza) has been suffering from a harrowing time in Sony Entertainment Television’s Ekk Nayi Pehchaan. This also brought in a lot of drama in the Jay and Kinnari Mehta Productions’ show with Karan losing his trust on Sakshi and she on her part, trying to win over her husband’s love once again. Dhillon) will use a very interesting trick. On the occasion of Diya’s doll’s wedding, Sharda will ask Sakshi to perform a dance number. And once her bahu will be on the floor, Sharda will force her son to join the dance. The duo will be seen matching steps on the Nagada number from Ram-Leela. Also on the insistence of Sharda, Latika (Ankita Bhargav) and her husband Prateek will join the fun and the entire family will be seen having a gala time. Will Sharda’s trick work and will the couple finally unite? The dramatic show on Sony Entertainment Television, Ekk Nayi Pehchaan (Jay and Kinnari Mehta) that has been focusing on Sharda (Poonam Dhillon) and her quest to find her identity, will soon reflect on the romance between Sakshi (Krystle D’souza) and Karan (Karan Sharma). Well, this surely would come as great news for all fans of the couple who have been missing the sweet romantic chemistry in the show. At her home, everyone will be worried about Sakshi and Suresh (Sooraj Thappar) will ask Sharda to take a break from her studies and take care of Sakshi. And this is when Karan will take charge and tell his family that he will take care of Sakshi and nurse her back to health. Karan, as viewers have seen, has been quite an irresponsible person and thus Sharda will be apprehensive to leave Sakshi in Karan’s care. But Karan will assure his mother that he will not let her down and will take proper care of Sakshi and help her recover soon. So will this moment bring the couple together? Will love finally bloom between the two? A couple of days ago Tellychakkar.com had reported how an upset Sakshi (Krystle D’souza) would leave her house after a spat with husband Karan (Karan Sharma) in Sony Entertainment Television’s Ekk Nayi Pehchaan (Jay and Kinnari Mehta Productions). Not wanting to have someone have a say over him, Karan had asked Sakshi to leave him alone. Thus the couple, who had just started to find love between them, got away from each other. But as predicted by 'expert mom' Sharda (Poonam Dhillon), Karan has already started missing Sakshi in his life and wants her back home. With the family wanting to call back Sakshi, they will ask Karan to get her back. And the boy, who is generally very lazy when it comes to work, will happily agree to go to Sakshi’s place and bring her back. Sharda will tell Karan that his younger brother can bring Sakshi home and he does not need to go. But Karan will be adamant and tell her that he will do so as it won’t look good if he doesn’t go to her house. This will bring in a ray of hope in Sharda’s life after which she will be positive that Karan and Sakshi would reunite. But will Sakshi agree to come back with Karan? The popular show on Sony Entertainment Television, Ekk Nayi Pehchaan (Jay and Kinnari Mehta Productions) is currently showing how with the passage of time, Sharda (Poonam Dhillon) is getting a strong foothold in her journey to discover herself. Her daughter-in-law Sakshi (Krystle D’souza) has got her admitted in a coaching centre for elders where slowly and steadily Sharda is trying to adjust herself. However, Sharda will have her task cut out as she would have to get friendly with her classmates at the centre. And this will not be an easy task for her. So what will she do to break the ice? Well, to get friendly with the classmates, Sharda will cook some delicacies and take it along with her to impress them. She will succeed in her attempt too, as all will relish her delicacies, and will even start singing praises about her cooking talent. But this will not go down well with Professor Kamath (Rituraj Singh). He will reprimand Sharda for bringing food to the class as in his words, “this is not a cooking class”. Prof. Kamath will then ask the class to write an essay on themselves. Not knowing what to write, Sharda will ask one of her classmates to write an essay for her. And the classmate will write about how Sharda manages her family so well. However, Sakshi will try to make her mother-in-law realize that apart from being a wife and a house maker, she is an individual and she has to realize this. She would force Sharda to write something about herself, and not about her family. Will Sharda be able to find her identity? We called up the senior actress Poonam Dhillon, but she remained unavailable for comment. Get ready to see if Sharda manages to sail through in her academic challenge. Drama is the key to any interesting sequence in Indian TV shows. It also adds to the emotional connect and gives the viewers a visual treat. Something on the same lines is going to unfold in Sony Entertainment Television’s popular show Ekk Nayi Pehchaan (Jay and Kinnari Mehta Productions). As earlier reported by Tellychakkar.com, Sakshi (Krystle D’souza) will get upset seeing her father-in-law (Sooraj Thapar) insulting her mother-in-law Sharda (Poonam Dhillon) for her being illiterate and causing a huge loss to their business. This will make the young girl decide to teach her mother-in-law to defend her self-respect. The daughter-in-law will decide that the best way to talk about this matter will be before God. Accordingly, she will take Sharda to a temple and present the idea of further studies. Initially, Sharda will not want to take up studies but a Godly occurring will change her mind. Well, Lord Krishna himself will give a green signal to her decision by dropping off a peacock feather on her and give a go ahead to her decision of taking up studies (clap clap). We tried to reach Poonam, but she remained unavailable for comment. We had recently reported about the developments in Sony Entertainment Television’s Ekk Nayi Pehchaan (Jay and Kinnari Mehta Productions) when Lord Krishna himself gave a sign of a go-ahead to Sharda (Poonam Dhillon) regarding her education plans. And now in the upcoming episodes, that explores the real relationship between a mother-in-law and daughter-in-law, the audience is all set to witness an interesting twist. The makers of the show, that marks the entry of Poonam Dhillon on the small screen, is leaving no stones unturned to entertain its audiences. Now the entertainment quotient is set to be doubled as the viewers will get to see a new beginning in Sharda’s life. Sharda’s daughter-in-law Sakshi (Krystle D’souza), who was upset about her mother-in-law being ridiculed by their family for her being illiterate, will enroll her in an English coaching class. Sharda, who has been living the life of a simple woman being trampled by words and insult from her family, will find a new direction by way of this decision of Sakshi. But her first day at the coaching class will not be a happy one. Anxious! Well here we give you the details. As Sharda will step into the class filled with teenagers, the young group will take her to be their teacher. And as Sharda will try to clear out their confusion, this would also embarrass her a lot. But the teacher will come to her survival and make Sharda comfortable with her classmates. Will this incident act as an obstacle to Sharda’s journey and will Sharda be able to find her way? We called Poonam on this but she remained unavailable for comment.